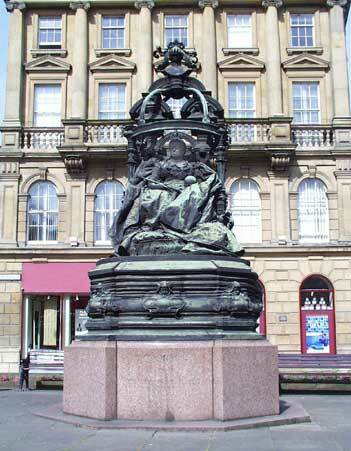 This bronze statue of Queen Victoria by the sculptor Alfred Gilbert was unveiled in 1903. Location: Adjacent to St Nicholas' Cathedral. Materials: Bronze and Pink Granite. Status: Listed Grade II*. The figure of the elderly Queen Victoria is seated on the throne with an elaborate canopy on a pink granite base is by the sculptor Alfred Gilbert. It was erected as the gift of Sir William Haswell Stephenson, Mayor of the City, to commemorate the 500th anniversary of the Shrievality of the City. The base of the statue is similar in design to that of Sir Alfred Gilberts most famous work 'Eros' in Piccadilly Circus. The story is, that the figure faces west so that the Queen will not have her back to the cathedral, which would have been insulting to the church, or the Town Hall which once faced the cathedral which would have been insulting to the corporation.